The ReArise Twitter has announced that Digimon ReArise is in the midst of being released right now for iOS and Android. They're doing final checks and confirmations, so if you see the game already up in app stores in Japan the game will show as being in maintenance mode at first. Notifications should be sent to pre-registered users soon. Digimon ReArise is available on both the iOS App Store and Google Play. We've made a discussion thread for the game here for when people can start actively playing it. Update- Based on various comments on Twitter, it appears the game is now live. Update- To celebrate the game being released they're doing another contest/campaign on Twitter. It's relatively easy and only open to those in Japan. 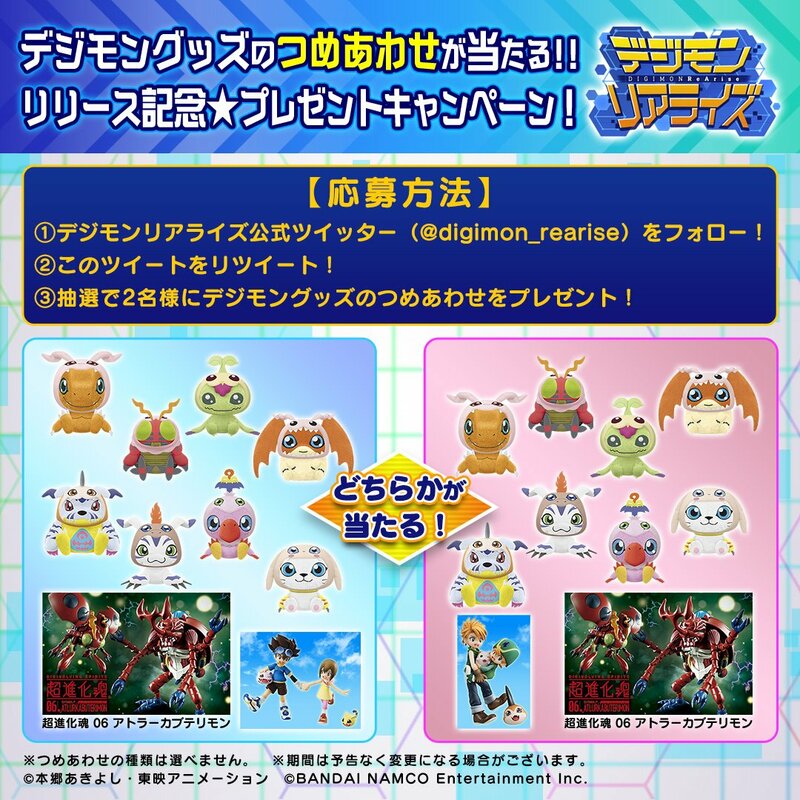 Follow the Digimon ReArise Twitter and retweet this tweet. Two winners will each get to choose the prize package they want. Both prize packages feature series 1 and 2 of the tri. dress up plushie crane game prizes and Digivolving Spirits AtlurKabuterimon. The only difference between the two prize packages is what set of GEM sibling figures you get: Taichi and Hikari or Yamato and Takeru. The campaign ends July 9th. The game appears to be live now. Hooray. Now to wait for everything to be released from people playing it. Updated with info on a Twitter campaign to celebrate the release. I can confirm it's actually pretty fun. It definitely feels like it's story driven, so I'm sure my opinions would improve if we got it here in the US. But I like it's style much more than Linkz. The only problem is its gacha is much more unforgiving. You have to roll for Digimon that can reach Mega level so a lot of the Digimon you get can only be useful up to a point, and even then the rolling percentages are rather scary. If the odds were better I'd like it much more. I also can't figure out how to get the chip for Erismon to Digivolve but that's another story.